Preparing your English listening test for National Examination, you should be very familiar with typical questions given. The SKL (standard competence) given for the test remains similar from year to year. So it is very advisable for students to prepare the listening test by studying and exercising the tests from previous years. There are 3 items you should know or have when doing it. 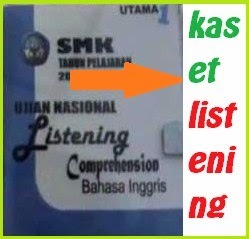 Today we are going to learn and exercise the listening test from UN SMK 2008. You can see the written question book here. If you have not had the audio MP3 file yet, you can download it here. And now the following post is the transcript of the audio. Directions: For each question, there is a picture and four short statements about it on the tape. They are spoken two times and are not written out in your test book. So you must listen carefully. You must choose one sentence A, B, or D that best describes the picture. Then, on your answer sheet, mark your choice. d. We need the basket for this stuff. Choice (a) “The basket is made of woven rattan” best describes what can be seen in the picture. Therefore, you should mark (a) on your answer sheet. a. He’s wearing a rain coat. b. He’s holding sunglasses in his hand. c. He’s covering his head with something. d. He’s using a long scarf around his neck. a. The man is standing behind the desk. b. There is a lot of stuff on the desk. c. There are a lot of people in the exhibition. d. The man is on the stage. a. The man is working with a computer. b. They are waiting for guests to come. c. The girls are serving dinner. d. Some people are going to the cafe. You hear : Will you be here this summer? a. Yes. Summer is my favorite season. b. Yes. They will be here soon. Which one do you think will suit me better, the black gown or the red one? a. Please sit down and relaxed. b. The black one looks more elegant. c. You’d better buy it yourself. Why don’t you take a public speaking class? a. I enjoy public speaking classes. b. I’m speaking English slowly. c. That’s a good idea. You study at school from seven to three everyday, don’t you? a. Yes, we study at school everyday. b. Yes, we spend eight hours a day at school. c. No, I don’t go to school at seven everyday. Excuse me I’m looking for a travel agent around here. Do you have any idea where it is? a. I’m sorry, I’m a stranger myself. b. I’m not a travel agent staff. c. My idea is better than yours. Directions: In this part of the test, you will hear several short conversations. The conversations will not be printed in your test book. You will hear the conversation two times, so you must listen carefully to understand what the speakers say. Girl : Are you sixteen yet? Boy : Not yet, but my birthday is in March. Girl : When in March? Boy : It is March 20th. What do you learn from the conversation? a. The girl is sixteen years old. b. The boy is twenty years old. d. The girl’s birthday is March 20. Choice (c) “The boy was born in March” best answers the question "What do you learn from the conversation?" Therefore, you should mark (c) on your answer sheet. Man : According to the weather report on TV last night, it might rain heavily in our city tomorrow. Woman : In that case, I should always bring an umbrella. Man : Can’t I smoke here? Woman : Don’t you see the no-smoking sign on the wall over there? Man : I’ll go out. Man : I can’t let you go beyond this point without a boarding pass. Woman : I realize that but I want to say good bye to my daughter. She’s only ten. Man : I’m sorry, mum but you’ll have to do it here. Man : Congratulation. I heard that you got a scholarship. Woman : Thank you very much. Man : I know that you can make it. Directions: In this part of the test, you will hear several short talks. Each will be spoken two times. They will not be printed in your test book, so you must listen carefully to understand and remember what is said. Let’s begin with the following short talk. Questions 12 to 13 refer to the following instruction. Want to make a simple dessert for your party? Try this caramel pudding. You only need to prepare four eggs, 200 cc of milk, 200 grams of sugar, and half tablespoon of vanilla. First of all, you have to melt 100 grams of sugar so it becomes caramelized, and then pour it into a Pyrex disc. Second, mix eggs, milk, and another 100 grams of sugar and also vanilla. Stir them for a while using a fork. At the end, pour the mixture into the Pyrex disc and steam it for about 45 minutes. Questions 14 to 15 refer to the following announcement. Attention shoppers, someone has just turned in a leather purse. It was found on the floor of the women’s cloth department. If this purse is yours, please come to the customer service counter to claim it. So to make a conclusion, the test of listening is divided into 4 parts. They are photograph test, question and response test, short conversation test, and short talk (short monologue) test. That four kinds of test should be mastered for passing the exam.